We are lucky to have visited many beautiful parts of New Zealand over the past year. Here is a selection of our favourite spots to visit this summer. In the 1880s many of the towns around north Hokianga were thriving mill towns. Kauri was hauled in and shipped out until eventually the trees were gone and the mills closed down. Now there are tiny towns, stepping up the hills above the harbour. Many of the buildings are over 100 years old and some are beautifully preserved. The road ends at Mitimiti, where half a dozen houses huddle behind the sand hills and wild ocean sweeps up a brown-sand beach. At low tide you can paddle in warm pools and gather mussels from crevasses in the rocky outcrops. With 3350 kilometres of coastline, the Kaipara is the largest harbour in the southern hemisphere. It has two great arms; one pointing north to Dargaville and the other south to Helensville. Between these arms hundreds of salty rivers sneak up valleys and squeeze between crumpled hills. Some of the hamlets spread around a wharf or beach on these quiet waterways are Tinopai, Pahi, Whakapirau, Batley, Tanoa and Port Albert. Further north, lumberjacks used to fell kauri forest, starting at the harbour’s edge and working back until the great logs were dragged long distances down tramlines to the Kaipara mills. 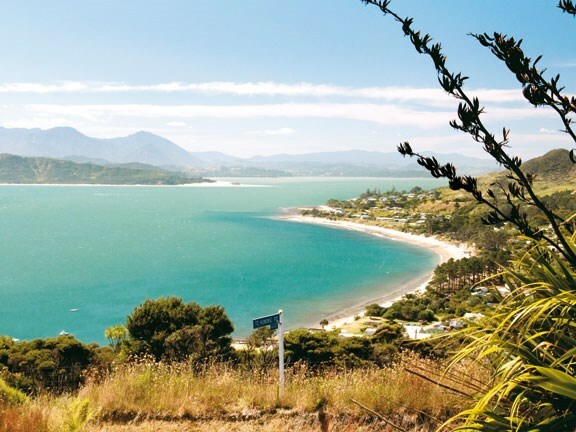 Tawharanui Regional Park is on a finger of land stretching towards Little Barrier Island in the Hauraki Gulf. There is a necklace of pretty beaches near the road end, on the sunny north side, and steep forested cliffs on the south side facing Kawau Island. The fisherman’s track, latterly named the ecology walk, crosses this peninsula, meandering up a valley through stunning rainforest. The park is home to a growing bird population, including bellbirds, black robins, ducks, dotterels, kereru, tui and kiwi, as well as lush native greenery like puriri, nikau and ponga. When people think of Auckland, its wild, far western reaches quite often don’t come to mind. And yet this huge area of rugged ranges and wind-battered beaches is one of the city’s great playgrounds. Much of it comprises the Waitakere Ranges Regional Park, which includes 16,000 hectares of native rainforest, rocky coastlines, black sand beaches and 250km of walking and tramping tracks. The park was formed over many years and is home to numerous historic sites. And for self-contained motorhomers there are a number of ARC parking places in attractive and natural locations. 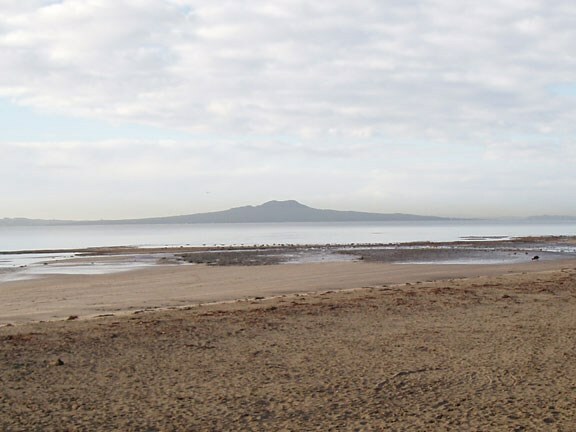 If you are visiting Auckland City, you can’t help but notice Rangitoto Island’s distinct, humped shape brooding on the horizon. 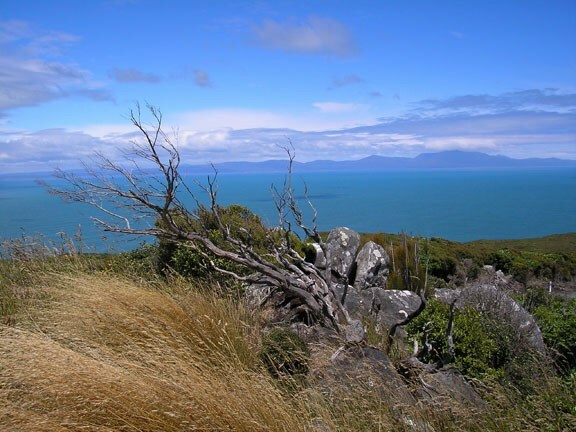 There are several walks you can do on the island – including the one-hour climb to the summit, 260m high. Seedlings, plants and ferns are scattered among the nooks and crannies of the lava, slowly encroaching it. Rangitoto Island is home to over 200 species of trees and flowers, including several species of orchid and natives such as northern rata. It also has the largest forest of pohutukawa in the world. The water in Lake Rotoiti flows from Lake Rotorua, across a man-made weir on the narrow (and natural) Ohau channel, and exits by way of the Kaituna River, which eventually tips into the Pacific Ocean at Maketu. Drive north along the side of Lake Rotorua to Hamurana Springs, where a lovely walk through a towering redwood forest will take you to the amazing 15-metre-deep cold spring that pumps out 4,500,000 litres (1,000,000 gallons) of crystal clear water an hour. Along the south eastern shore, accessed by H30, a wide stretch of lawn leads right to the water’s edge. There are plenty of pull-off points on the lakeside towards Koro Kitewao Bay on Highway 30. These are quiet and scenic places to park up for lunch or dinner and appreciate the tranquility of the lake. The cliff-hugging highway north of Kaikoura is punctuated by signs telling motorists of seal haul-out areas. At Ohau Point, about 30km north of Kaikoura, there were dozens of basking and dozing New Zealand fur seals of all shapes and sizes. The best time to see the seal pups playing under the waterfall at Ohau Stream is during the winter haul-out period from May to July. In springtime the pups are weaned and begin to disperse. Juvenile fur seals have been found as far as 1000 kilometres from where they were born. If you can brave the freezing water, several commercial operators take seal-swimming trips in the Kaikoura area. 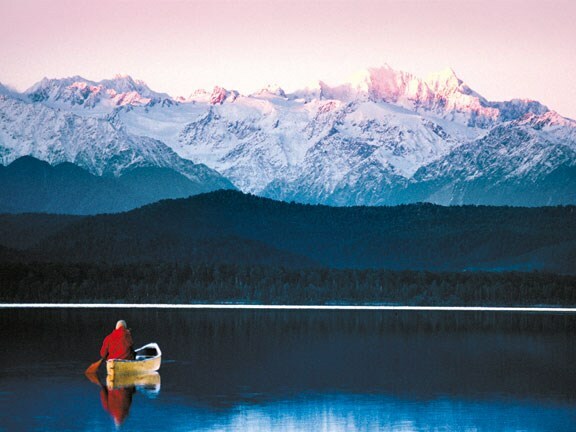 One of the greatest attractions of Hokitika is outdoors. Fishing for brown trout in the local spring creeks and mountain rivers is challenging and there is a lot of good country to be explored on a mountain bike. There are plenty of walks, short and long, especially around the nearby Lake Kaniere, 19km east of Hoki, and the Hokitika Gorge Scenic Reserve, where, among the towering granite cliffs, a swingbridge spans pools of milky blue-green river against the background of an old rimu forest. Closer to town you can go on a paddle boat cruise aboard the Takatahi Bell, which will take you through the old steamers’ waterway up the Mahinapua Creek to its namesake lake, along the water corridor in the rainforest of rimu, matai and kahekatea. Glenorchy is the main entry point into Mt Aspiring and Fiordland National Parks, and thus a mecca for trampers. Before heading out on longer excursions you may want to start with shorter walks like the one-hour loop called Glenorchy Lagoon Walkway. Next to walking and tramping, fishing for trout is one of Glenorchy’s greatest attractions. The variety of waters is enormous, from the main rivers and their tributaries to smaller lakes, lagoons and spring creeks. 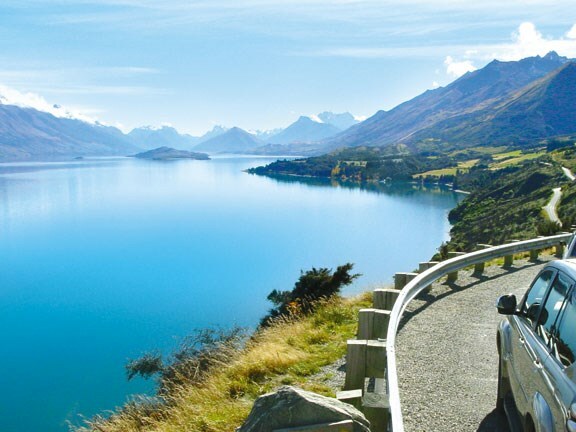 When the lake is calm a superb way of exploring is by sea kayak and with its wide valleys and river flats, Glenorchy is good for horse riding. 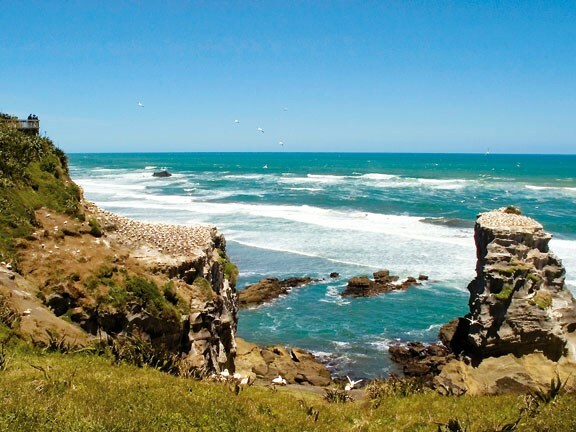 Wrap up in a windproof jacket and explore one of the Southland’s wild beaches, like the Oreti or Colac Bay. Seven kilometres west of Invercargill, at the southern end of Oreti Beach, is Sandy Point, a sand dune forest of matai and totara, with some miro, rimu and kahikatea, their crowns felted by the wind. Waipapa Point, at the beginning of the Catlins road near Fortrose, is a wild southern beach and the scene of the sinking of SS Tararua, New Zealand’s worst civilian maritime disaster. In the aftermath of the tragedy a lighthouse was built at the Waipapa Point, and today it still winks its warning out to sea. The long golden beach is a favourite hang-out for the sea lions.